Postpartum thyroiditis ( PPT ) is a common thyroid disorder that presents during the first postpartum year. It is the occurrence of either transient hyperthyroidism , transient hypothyroidism , or transient hyperthyroidism followed by transient hypothyroidism . 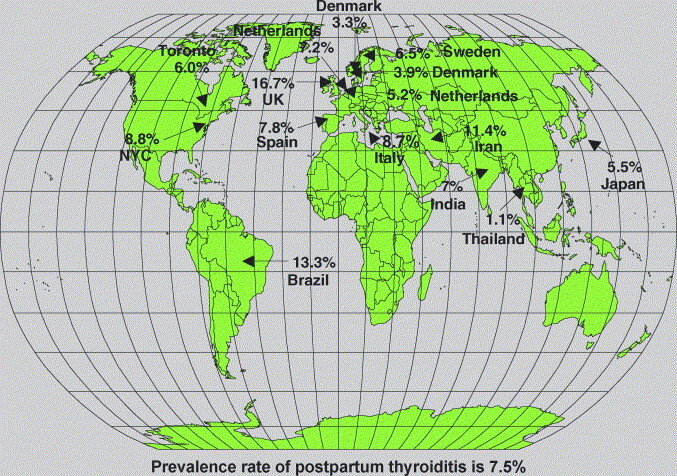 Most, but not all, women are euthyroid 1 year postpartum. Postpartum thyroiditis is an exacerbation of an underlying autoimmune thyroiditis, aggravated by the immunological rebound that follows the partial immunosuppression of pregnancy . Women who express human leukocyte antigen haplotypes DR-3, DR-4, and DR-5 have an increased risk for postpartum thyroiditis. In women who develop postpartum thyroiditis, CD4+ / CD8+ and CD4+ 2H4+ ratios are elevated throughout pregnancy and the postpartum. Histologically, thyroid aspirates reveal either a lymphocytic infiltrate or diffuse destruction, changes similar to those seen in both Hashimoto’s thyroiditis and painless sporadic silent thyroiditis. In essence, the immunological rebound that follows the end of pregnancy precipitates the clinical expression of Hashimoto’s disease, which before pregnancy was clinically silent. The prevalence of postpartum thyroiditis varies widely. Although geographic differences account for some of the variance, a critical factor has been methodological differences in study design. Not only has every prevalence study used a different methodology, but few studies performed their initial screen during pregnancy. Consequently, some of the women diagnosed with postpartum thyroiditis may have had preexisting Hashimoto’s disease. The prevalence of PPT varies dramatically, ranging from 1.1 to 16.7%. Explanations for the variation include differences in study design (in particular the frequency and duration of screening postpartum), whether or not screening was initiated during pregnancy or began postpartum, differences in how PPT was defined, and inherent geographical differences. Figure 1 illustrates the prevalence of PPT in studies in which screening was performed a minimum of twice postpartum and extended until at least 5 months following delivery. Fifteen studies met this criterion with a prevalence of PPT varying between 1.1 and 16.7% (mean=7.5%). Women who have had an initial episode of PPT have a 70% chance of developing a recurrence with a subsequent pregnancy. Postmiscarriage thyroiditis also occurs, but no prevalence data are available. Furthermore, as in type 1 diabetes , I postulate that women with other autoimmune diseases, such as systemic lupus erythematosus , rheumatoid arthritis , and scleroderma would have an increased prevalence of postpartum thyroiditis. The prevalence of TPO (thyroid peroxidase antibodies) antibodies in patients with type 1 DM reported in the Familial Autoimmune and Diabetes Study was 26.6% . In accord with this, the incidence of PPT in women with type 1 DM is higher than in an unselected population and ranges from 18–25% . One of every 25 women in southern Italy developed PPT. Women at high risk for thyroid disease have an increased rate of PPT. The high rate of permanent hypothyroidism at 1 year should result in a reevaluation of the widely held belief that most women with PPT are euthyroid at the end of the first postpartum year. PPT thyroiditis is the result of an autoimmune process. Pathologic examination shows lymphocytic infiltration of the thyroid gland by B cells and cytotoxic T cells.There is widespread inflammation and apoptosis of thyroid cells, which causes release of preformed thyroxine (T4) and triiodothyronine into the circulation. Production of new thyroid hormone ceases for an interval because of damage to thyroid cells and the subsequent drop in TSH in response to elevations in T4 and T3. After inflammation resolves, TSH rises and production of thyroid hormone resumes. However, if there is significant thyroid damage, permanent hypothyroidism can ensue. It is not clear what triggers this autoimmune process, though it is clear that it is initiated by activation of thyroid antigen-specific helper T cells . One theory suggests that certain viruses contain a protein that activates thyroid-specific T cells. Another theory is that thyroid epithelial cells present their intracellular proteins to T cells. T cells activated in this way induce B cells to secrete thyroid antibodies (thyroid peroxidase antibodies). Thyroid peroxidase (TPO) antibodies are cytotoxic to thyrocytes, the thyroid hormone-producing cells in the thyroid. Approximately half of all women with PPT have a family history of autoimmune thyroid dysfunction, indicating a genetic link to risk for the condition. Molecular studies have identified the major histocompatibility (MHC) region, located on chromosome 6, as important in determining T cell and antigen response in autoimmune thyroiditis. There also appears to be a link between the HLA-DR3, HLA-DR4, and HLA-DR5 antigens and risk for both PPT and Hashimoto's thyroiditis. Clinically, the hyperthyroid stage of PPT lasts about 8 weeks and is self-limited. The subsequent hypothyroid stage of PPT lasts a bit longer, on average 4 to 6 months. The hypothyroid phase is then followed by a return of normal thyroid function. Twenty to thirty percent of women with PPT will remain permanently hypothyroid instead of showing the typical pattern of resolution. Long-term follow-up of women with PPT also reveals that permanent hypothyroidism is more likely to develop in these women. Twelve to sixty-one percent will be hypothyroid 3 to 9 years following an episode of PPT. Thus, these women should be considered to be at higher risk of developing hypothyroidism at some point in life. Factors that appear to increase the risk of persistent hypothyroidism include delivery of female infant, higher levels of TSH during the hypothyroid phase, and increased maternal age. Prospective studies have been conducted in large groups of pregnant women to identify risk factors for PPT. Pregnancy is associated with significant changes in immune function. For instance, there is normally an increase in CD4, CD25, and regulatory T cells. These changes result in reduced T-cell and B-cell function, perhaps to allow for tolerance of the immunologically foreign fetus. Thyroid peroxidase antibody levels typically fall during pregnancy. This is thought to be related to both elevated progesterone and estradiol levels that are seen in pregnancy. T cells and B cells return to baseline function after delivery and play a key role in the lymphocytic infiltration of the thyroid gland seen in PPT. Numerous studies have shown that women who go on to develop PPT have high levels of circulating antithyroid antibodies early in pregnancy. And after delivery, there is an increase in autoantibody secretion, along with decline in estrogen levels, and there can be exacerbation of autoimmune-mediated illness such as PPT. Patients who present with thyroid dysfunction in the first year postpartum will likely have PPT. The most important alternate diagnosis to consider is new onset Graves' disease (incidence 0.2% vs approximately 7% for PPT). Many women (and health care providers) may attribute these symptoms to the demands of caring for a new infant, expected struggles with weight postpartum, and drastic change in routine that occurs with new mothers. Some speculate that women may not seek health care for symptoms that are “just related to being a new mom.” Thus, it is important to consider thyroid disorders when these symptoms are present, and to consider the possibility of a postpartum thyroiditis in the differential of symptoms that develop in the postpartum year. Women with postpartum depression are also more likely to have had previous history of depression, family history of depression, and increased life stress in addition to childbirth (such as financial hardships, neonatal health problems, stillbirth, or marital conflict). careful patient history, review of systems, and physical exam are important in discriminating between PPT and postpartum depression. When in doubt, obtaining a TSH can help distinguish between the two disorders. Are women with PPT at higher risk of developing postpartum depression or other mood disorders? One study assessed 748 postpartum women for both abnormal TSH, free T4, thyroid peroxidase antibodies, and the presence of symptoms of depression, anxiety, and panic disorder. Those diagnosed with PPT were more likely to meet criteria for anxiety, but not depression. Once suspicion of thyroid disease is established by history and physical exam, laboratory testing is indicated (Figure 1). If the patient presents during the hyperthyroid phase of PPT, thyroid labs will reveal suppressed TSH. Further thyroid labs will reveal accompanied elevated free T4. With this pattern of thyroid function studies, it is important to rule out other causes of hyperthyroidism, especially Graves' disease. Symptoms of hyperthyroidism may be more pronounced in Graves' disease versus PPT. Graves' opthalmopathy is also absent in PPT. The 24-hour radioactive iodine uptake on thyroid scan is typically low in PPT (related to thyrocyte destruction by the autoimmune process), whereas uptake will be high in Graves' disease (related to persistent activation of thyrocytes by the auto-antibody thyroid-stimulating immunoglobulin). A radioactive iodine thyroid uptake study may not be an appropriate diagnostic tool for all women, as it is contraindicated in women who are breastfeeding. Patients may also present in the hypothyroid phase of PPT. A history of hyperthyroid symptoms preceding hypothyroid symptoms would provide support for a diagnosis of PPT. In the hypothyroid state, the TSH will be above normal, and free T4 will be low. Findings of an asymmetric or nodular thyroid gland would lead to consideration of toxic multinodular goiter or a single toxic nodule. A tender thyroid gland that is accompanied by symptoms of viral infection would be associated with acute painful thyroiditis. palpitations, fatigue, heat intolerance, and/or nervousness. The dose of propranolol should be titrated to achieve symptomatic relief. The duration of therapy typically does not exceed 2 months. Treatment decisions for women in the hypothyroid phase of PPT depend on both the degree of hypothyroidism and whether the woman is attempting pregnancy. Asymptomatic women who are not planning a subsequent pregnancy and whose TSH level is between 4 and 10 do not necessarily require intervention and should, if untreated, be reevaluated in 4–8 wk. Women with a TSH between 4 and 10 who are either symptomatic or attempting to become pregnant should be treated with thyroxine. Finally, all women with a TSH that exceeds 10 should be treated with thyroxine.